Jimmy CarsonEven when he was just 5 years old, Jimmy Carson had dreams of playing in the NHL. At the ripe young age of 18, he got his wish. 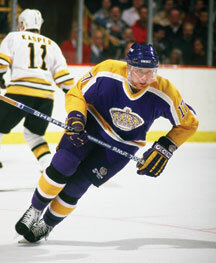 The 2nd overall pick of the struggling Los Angeles Kings in the 1986 NHL Entry Draft, Carson was the youngest player in the NHL when he took the ice for his first game as a pro. He was living the dream, staying in a house next door to teammates Luc Robitaille and hockey legend Marcel Dionne, who would drive the rookies to practices and games. Carson helped the Kings make its way up the standings, putting up 79 points in his rookie season, and 107 the following year. That July, Carson received a call from Kings’ owner Bruce McNall. Wayne Gretzky was coming to Los Angeles. The bad news: The Oilers wanted Carson in the trade. Though McNall tried to keep him out of it, the deal was finalized in early August and Carson packed his bags for Edmonton. He continued to produce, scoring 49 goals and adding 51 assists in his first season with the Oilers, but just four games into his second year, he asked to be traded. “The city and the country weren’t happy about the trade, and it was hard showing up as the symbol of Gretzky not being there,” he recalled. Carson was sent to his hometown team, the Detroit Red Wings, where he was a third-line center behind Steve Yzerman and Sergei Federov. After four seasons, he was traded back to the Kings for two years before spending time with the Vancouver Canucks and the Hartford Whalers. In 1998, Carson hung up his skates, moving back to Michigan where he and his wife Paula have four kids: Charlie, John, Andrew and Mia. Surprisingly, none of them play hockey. Mike GrierWhen it comes to Mike Grier’s hockey career, the content of his character and not the color of his skin is what people should focus on. From his early days in youth hockey, Grier has played the game with a ferocity and passion that is matched by few others. Now in his 12th season in the NHL, the Detroit native shows no sign of slowing down. His San Jose Sharks are currently leading the NHL in points, and Grier is on track to have one of his finest years. Grier’s arrival in the NHL was an important step for USA Hockey, which has long been a supporter of bringing more minority players into its ranks. Grier and goaltender Doug Bonner were the first African Americans to play on the U.S. National Junior Team in 1995. Part of the secret to his success is that Grier never let racism slow him down. “I know it’s important how I carry myself,” he said. Grier was a Massachusetts high school player when he was drafted by the St. Louis Blues. To many it was his size, not his race that would be his downfall. Still, coaches and scouts saw something in the way Grier played the game to give him a shot. The son of former NFL running back Bobby Grier, the youngster was a force on the ice, hitting anything that moved. It was at Boston University, where he was a walk on, that Grier refined all areas of his game. Legendary coach Jack Parker was concerned about Grier’s size, but Terriers assistant coach Blais MacDonald knew his character and drive to be a player would overshadow everything else. Grier worked with conditioning coach Mike Boyle to create better training habits. It paid off as he tallied 120 points in three seasons before making the jump to the NHL. In his six seasons in Edmonton, Grier averaged more than 75 games a season, and twice reached the 20-goal plateau. 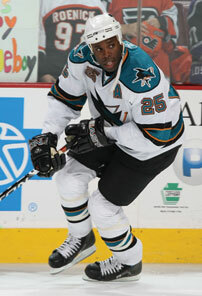 He was traded to Washington and Buffalo before finding a home in San Jose. Everywhere Tony Amonte played he was a fan favorite. From New York, where the Rangers selected him 68th overall in the 1988 NHL Entry Draft, to Chicago, where he gained stardom scoring at least 40 goals three times, to Philadelphia, where he teamed up with childhood pal Jeremy Roenick, to Calgary, where he scored his 400th NHL goal, Amonte left his mark on the game. Amonte made his NHL debut with the Rangers in the 1991 playoffs and followed it up with an impressive rookie campaign, scoring 35 goals. In Chicago, he was not only a scoring machine but also the model of durability, amassing a five-season-long streak where he did not miss a game. The Blackhawks honored the Hingham, Mass., native on Jan. 21, with Tony Amonte Heritage night. On the international front, Amonte represented the U.S. in numerous competitions, including two Olympics (1998 and 2002). But he may be best known for netting the winning goal in the 1996 World Cup of Hockey. Amonte retired in 2008, and is currently ranked 11th all-time in points among American-born players.